Major winners Rory McIlroy, Padraig Harrington, Graeme McDowell and Darren Clarke have all confirmed that they will play in the Irish Open in June. European Ryder Cup captain Paul McGinley and colourful American John Daly will also be part of the field at the tournament at Fota Island in Cork. 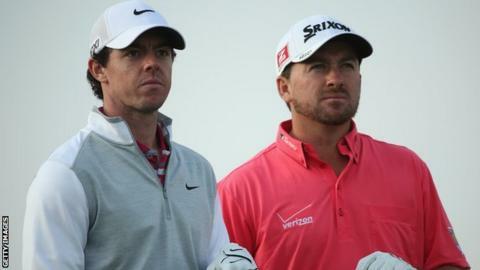 "I've never been to Fota but I know the Irish Open was a great success when it was hosted there before," said McIlroy. "It should be a good venue and it's good that they are moving it around." "The Irish Open is a big part of the European Tour schedule and has been for a long time now, so to still keep it going is important and I want to lend my support to it as much as I can. "It falls on the week after the US Open, so I would love to get a few more international players along, but it is a strong event in itself and it's great that all of Ireland's Major champions are supporting it once again," added the world number 11. Former Irish Open champion Shane Lowry and European Tour event winners Michael Hoey, Peter Lawrie and Damien McGrane have also confirmed their participation. Two-time Major champion Daly has established himself as a regular competitor and a huge favourite with Irish Open galleries with his outlandish playing attire and willingness to interact with spectators.